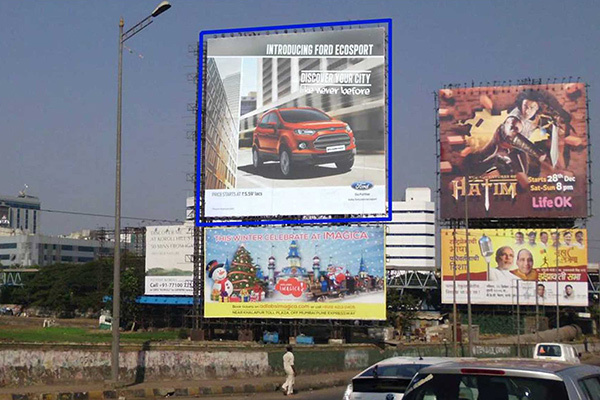 We have supremacy of experience and technology, making us the top rank outdoor advertising company in Ahmedabad, apparent from our 1000+ successful outdoor advertising ventures and gradually increasing customer all across India. Whatever your concern is associated with outdoor advertising, our experience can help you provide the best-suited solution that complies with your budget other than requirements. The offered rotating billboard is an exemplary of our capabilities in the outdoor advertising, exclusively designed to give the benefits of the motion and multiple advertisements at the cost-effective rates. This rotating billboard in Ahmedabad is swiftly gaining the fame for its trivision attribute, enabling a consumer to advertise three different messages in one space only, hence is also prominent as the trivision billboard in Ahmedabad. Interested one required to give three distinct images and messages to exhibit on the billboard, which is set on the three different prisms leveraging the expertise and experience of our team of the outdoor advertising. Each triangular prism is proposed to rotate at 120⁰ at certain time lapse that not only changes the message and image but also create the motion effect, is proved to be one of the effective attention grabbers in the advertising segment. Creativity and selection of the right color and brightness is an extra perk of our rotational billboard advertising, helping you seize that extra attention that definitely helps your brand to reach a new height of fame. Our Rotating Billboard Hoarding in Ahmedabad is available at different locations to give a consumer the broadest options in the location.